Cloud computing solutions from IT services providers in Orange County seem to be taking businesses by storm. It is actually the way of the future for all businesses, regardless of the size. Taking to the cloud can be quite beneficial especially for SMBs as it reduces internal IT resources and the time spent controlling and managing them. You can get rid of additional hardware and staff by taking advantage of the cloud’s scalability, availability, flexibility, security, reliability, and many others. Data loss or breach can make an SMB go out of business. You do not want to lose your data because your flash drive was stolen. You don’t even want some viruses to eat away the data. Taking to the cloud is a sure way of ensuring that your data is safe and can be recovered in case of any natural disasters. In addition, with the cloud’s spam management and antivirus protection, you have nothing to worry about. With cloud computing, you can actually save a lot. Consider the amount of money that you spend buying hardware, installing them and paying in-house technicians to maintain and operate them. You can evade this if you switch to the cloud. In fact, you can channel this money towards other important matters, such as product development, customer care, marketing, and even expansion of your business. The cloud makes it easy to achieve collaboration among the employees. They can work on the same master document. The fact that the same work can be accessed from various devices promotes collaboration among employees working from different locations but sharing the same data. In addition, SMBs owners can efficiently track individual performance and progress online. 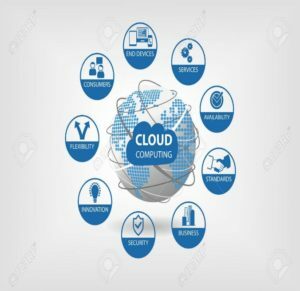 When you use cloud computing solutions from an IT services provider in Orange County, it means that you will only utilize the server space that you need. This means that your carbon footprint is reduced the carbon emissions and energy consumptions will not be as much as when you use onsite servers. Adopting cloud computing can reduce downtime. First, in case of data breaches or loss, you are sure to gain access to your data as soon as possible. This means that your normal operations will resume almost immediately. Your employees will be back to work. Consequently, there will be increased profits for you. In addition, moving to the cloud will give you the confidence to carry out your operations, knowing that your data is secure. You also do not have to worry about software updates, power requirements, and space considerations. Moving to the cloud is what any SMB needs. Intelecis, Inc. is an IT services provider in Orange County that can help you make a smooth transition to the cloud. Contact us today and let us help you make the right moves for your SMB.